Insider Monkey has processed numerous 13F filings of hedge funds and famous investors to create an extensive database of hedge fund holdings. The 13F filings show the hedge funds and investors’ positions as of the end of the third quarter. You can find write-ups about an individual hedge fund’s trades on numerous financial news websites. However, in this article we will take a look at their collective moves and analyze what the smart money thinks of National Retail Properties, Inc. (NYSE:NNN) based on that data. The number of hedge funds that owned National Retail Properties, Inc. (NYSE:NNN) dropped by 21% during Q2, as the quarter ended with just 11 of them owning the stock, or 1.7% of the funds tracked in our database. Billionaires Ken Fisher and Israel Englander have remained bulls, though the stock came nowhere close to ranking among Billionaire Ken Fisher’s Top Stock Picks Heading Into 2019. It did however land our list of the 25 Best Dividend Stocks for Retirement thanks to its 4.27% yield and 29-year run of paying dividends. How have hedgies been trading National Retail Properties, Inc. (NYSE:NNN)? Heading into the fourth quarter of 2018, a total of 11 of the hedge funds tracked by Insider Monkey held long positions in this stock, a 21% drop from one quarter earlier. 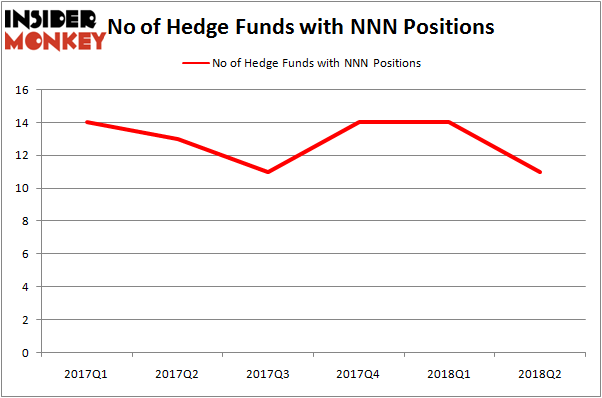 Below, you can check out the change in hedge fund sentiment towards NNN over the last 6 quarters. So, let’s see which hedge funds were among the top holders of the stock and which hedge funds were making big moves. 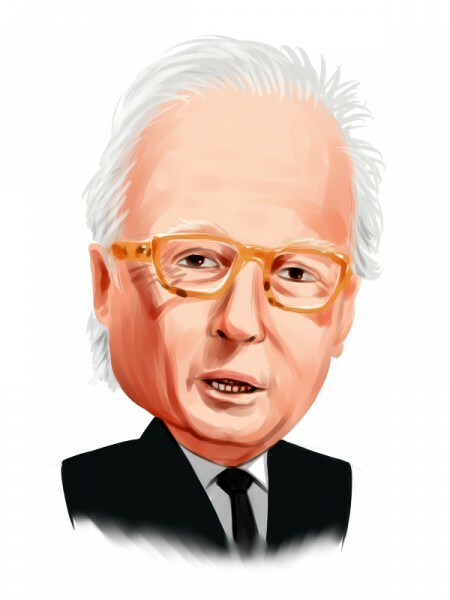 More specifically, Israel Englander’s Millennium Management was the largest shareholder of National Retail Properties, Inc. (NYSE:NNN), with a stake worth $44.7 million reported as of the end of June. Trailing Millennium Management was Fisher Asset Management, which amassed a stake valued at $20.9 million. Stevens Capital Management, Marshall Wace LLP, and Tudor Investment Corp were also very fond of the stock, giving the stock large weights in their portfolios. Judging by the fact that National Retail Properties, Inc. (NYSE:NNN) has witnessed declining sentiment from the smart money, we can see that there exists a select few money managers that decided to sell off their positions entirely last quarter. Interestingly, Dmitry Balyasny’s Balyasny Asset Management cut the largest position of the “upper crust” of funds tracked by Insider Monkey, comprising an estimated $16.9 million in stock. Greg Poole’s Echo Street Capital Management was right behind this move, as the fund sold off about $7.4 million worth. These transactions are important to note, as total hedge fund interest was cut by 3 funds last quarter. Let’s check out hedge fund activity in other stocks – not necessarily in the same industry as National Retail Properties, Inc. (NYSE:NNN) but similarly valued. These stocks are Lamar Advertising Co (NASDAQ:LAMR), Weight Watchers International, Inc. (NYSE:WTW), Encompass Health Corporation (NYSE:EHC), and Watsco Inc (NYSE:WSO). This group of stocks’ market valuations match NNN’s market valuation. As you can see these stocks had an average of 20 hedge funds with bullish positions and the average amount invested in these stocks was $341 million. That figure was $99 million in NNN’s case. Weight Watchers International, Inc. (NYSE:WTW) is the most popular stock in this table. On the other hand Watsco Inc (NYSE:WSO) is the least popular one with only 13 bullish hedge fund positions. Compared to these stocks National Retail Properties, Inc. (NYSE:NNN) is even less popular than WSO. Considering that hedge funds aren’t fond of this stock in relation to other companies analyzed in this article, it may be a good idea to analyze it in detail and understand why the smart money isn’t behind this stock. Dividend investors in particular should at least consider a look.